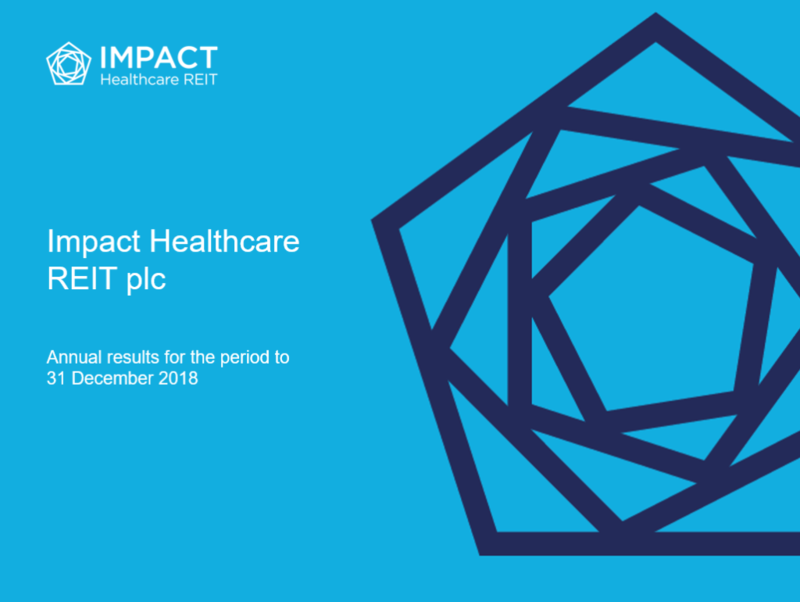 The board of Directors of Impact Healthcare REIT plc (ticker: IHR) (the “Board“), the real estate investment trust which gives investors exposure to a diversified portfolio of UK healthcare real estate assets, in particular care homes, is pleased to announce the appointment of Amanda Aldridge as a Non-Executive Director of the Company with immediate effect. Amanda will join the Audit, Remuneration and Nomination Committees and will also assume the position as chairman of the Audit Committee immediately after the Company’s Annual General Meeting in May 2019. Amanda was an audit and advisory partner in KPMG LLP from 1996 until 2017, when she retired from the partnership, having joined the firm in 1984 and qualified as a chartered accountant in 1987. She has significant experience as an external auditor, working predominately with quoted clients, often across multiple sites, with a focus on the retail, consumer and distribution sectors. Amanda has also advised quoted companies on corporate transactions and the assessment and remediation of internal controls and held a number of strategic and line management roles during her 32 years with KPMG LLP. Amanda’s audit and advisory work included clients with significant property portfolios. Amanda is currently a non-executive director of Headlam Group plc and chairman of its Audit Committee. She is a Fellow of the Institute of Chartered Accountants in England and Wales (FCA). In accordance with the Listing Rules, no further information is required to be disclosed pursuant to LR9.6.13R. The Company’s LEI is 213800AX3FHPMJL4IJ53. Its home member state is the United Kingdom. 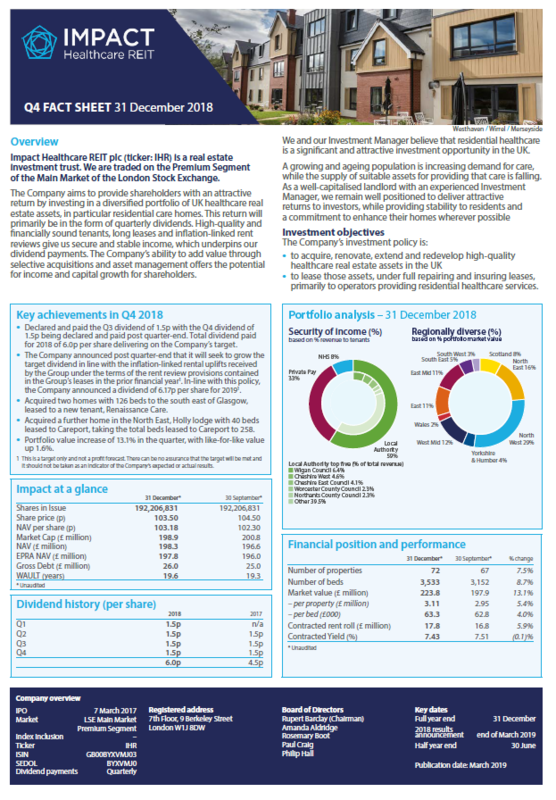 Impact Healthcare REIT plc is a real estate investment trust (“REIT”) which aims to provide shareholders with an attractive return, principally in the form of quarterly income distributions and with the potential for capital and income growth, through exposure to a diversified portfolio of UK healthcare real estate opportunities, in particular residential care homes. 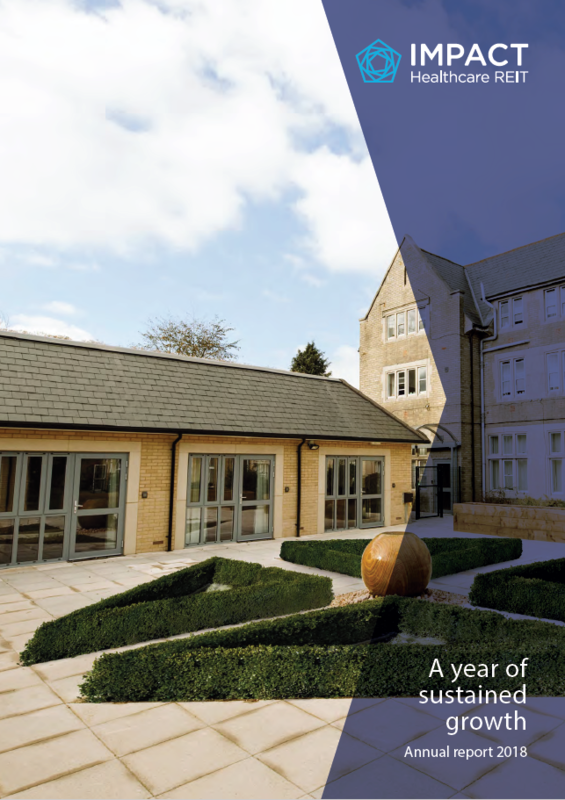 The Group’s investment policy is to acquire, renovate, extend and redevelop high quality healthcare real estate assets in the UK and lease those assets primarily to healthcare operators providing residential healthcare services under full repairing and insuring leases. The Group has now declared or paid seven quarterly dividends of 1.50 pence per share since IPO on 7 March 2017. The Company will seek to grow the target dividend in line with the inflation-linked rental uplifts received by the Group under the terms of the rent review provisions contained in the Group’s leases in the prior financial year. The Company is listed on the premium listing segment of the Official List of the UK Financial Conduct Authority and was admitted to trading on the Main Market for listed securities of the London Stock Exchange in February 2019.